Three of the league’s most promising young starters are also three of the league’s least efficient starters. Joba Chamberlain, Clayton Kershaw, and David Price are loaded with good velocity and bright futures with present issues in putting batters away within a timely manner. During the third inning of last night’s game, Chamberlain threw 48 pitches and allowed two runs without the ball so much as leaving the infield. Three walks and a pair of hit batsmen gave the Mets the lead without much of their own doings – the exception being Carlos Beltran’s 10 pitch at-bat that culminated in a walk; Beltran fell behind 1-2 and with the count worked full, fouled off three consecutive pitches before drawing ball four. 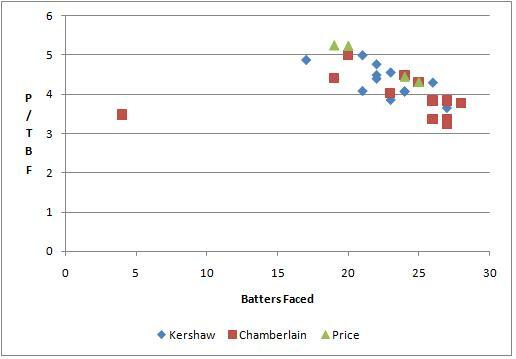 Despite the inning from fielding independent pitching hell, Chamberlain has been the most efficient of the trio; averaging 3.94 pitches per batter faced this season. Kershaw averages nearly a half of a pitch more per batter with 4.35, and Price is nearly an entire pitch more at 4.82. The former two are averaging a little over five innings per start while Price has made four starts this season and only pitched into the sixth inning twice. Despite the decent Zone% it’s not hard to see why Price is having the most issues. Sure, he’s throwing about the same amount of pitches in the zone as Kershaw, and more than Chamberlain, but less hitters are chasing Price out of the zone, meaning he’s actually throwing less strikes than Kershaw overall. Being a three true outcomes pitcher is hard work when your ratios are that high, although admittedly it is a pretty small sample size. Here’s a graph comparing the three. It contains each start made thus far, the average amount of pitchers per batter faced, and the total amount of batters faced. Take away the outlier on the left side of the graph and you can see the obvious inverse relationship between the two. Just in case you were wondering: Roy Halladay averages a little under 3.6 pitches per batter faced. We hoped you liked reading Young Guns Lacking Quick Trigger by R.J. Anderson! Intriguing data. However, “but less hitters are chasing Price out of the zone…. less strikes.” Fewer hitters, fewer strikes, son. ~Love, Miss Grammar.